Makes: around 1 Cup of Shallot Pickle. Soak tamarind in 1/8th cup of water. Microwave for couple of seconds to soften the tamarind. Extract all the juice and discard the pulp. Remove little bit of both ends and peel the shallots. Grind 3 shallots with little bit of water into smooth paste. Heat oil in a pan, add mustard seeds, fenugreek seeds and asafoetida. Once mustard seeds start spluttering, add peeled shallots, ground shallots and few pinches of salt. Cook covered on low flame for around 10 minutes or until shallots are cooked. Uncover, fry briefly, stir in tamarind extract, jaggery, turmeric powder, red chili powder and salt. Boil for few seconds and remove from heat. Store in a refrigerator and the pickle stays fresh for around a week or two. 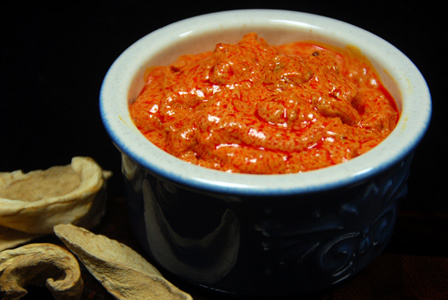 Serve shallot pickle with yogurt rice or with dal rice. Notes: Prefer small sized shallots. Suggestions: Adjust jaggery and tamarind according to your preference. Variations: Check mango yogurt rice and cucumber poha rice. Other Names: Shallot Pickle, Madras Onion Pickle. 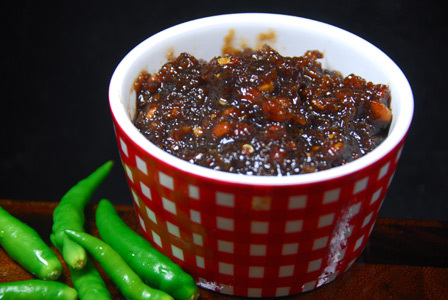 Makes: around 1 Cup of Ground Mango Pickle Chutney. In a mixing bowl, add ground mango pickle. Mash it lightly with help of a pestle, add onion and yogurt. Mix well and keep the pickle aside. Once cooled, add the spices to the above mango pickle bowl. Notes: Make sure not to add too much yogurt. Suggestions: Adjust yogurt for chutney consistency. Variations: You can also add finely chopped green chiles if you wish. 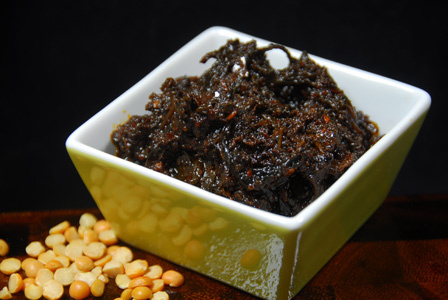 Other Names: Ground Mango Pickle Chutney, Tokkudu Magaya Pachadi. 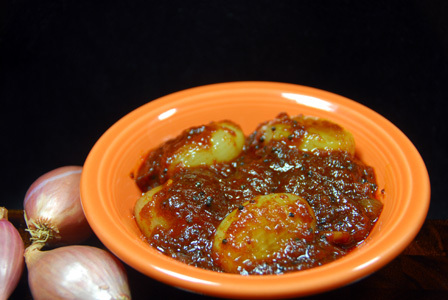 Makes: around a Cup of Wood Apple Pickle. Crack open the velagapandu / wood apple and scoop all the inside flesh and discard the shell. Using a mortar and pestle, pound the green chiles coarsely along with jggery. Finally add the velagapandu flesh and pound till it forms a paste. Store wood apple pickle in a tight jar and you can refrigerate for couple of months. Notes: Make sure wood apple is not too ripe or not too raw. 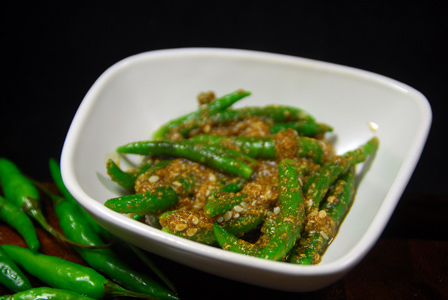 Suggestions: Adjust spice with green chile and depending on the tartness of velagapandu, adjust jaggery. Other Names: Kath Bel Pickle, Velagapandu Pachadi.